The aspirants of the Goa Sarkari Naukari are alerted. You don’t need to go anywhere else to know the Latest Goa Govt Jobs 2018 or even the Upcoming Govt Jobs in Goa. To content your pursuit all the information is provided right at one place. 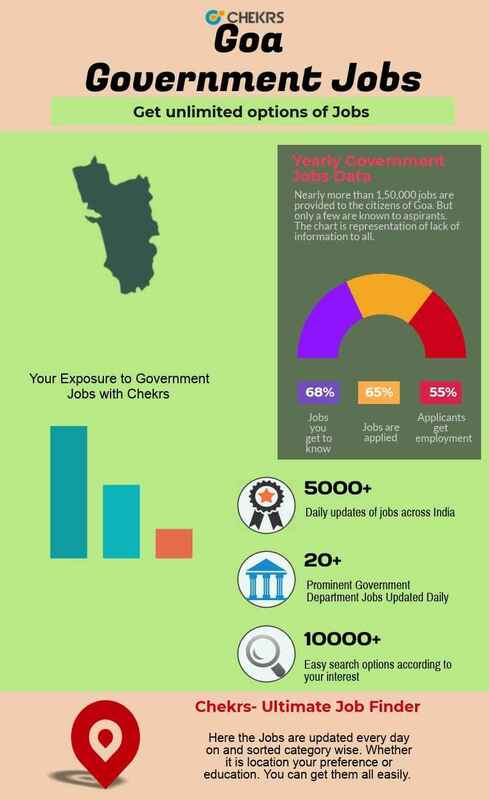 There are a lot of vacancies that are released yearly by the Goa government to provide employment. The only requirement is that firstly the candidates needs to clear out that tere are o jobs because here you are brought into attention all the Goa Government Jobs. You can get the right match according the education level such as Government Jobs in Goa for 10th Pass, 12th pass, Freshers, Engineers, Graduates, Post Graduates, etc. All you have to do is subscribe the services of jobs.chekrs.com. Why Chekrs for Upcoming Jobs in Goa? There might be many websites serving the information for Government Jobs in Goa but the legitimate information is provided here only. In order to assure that you apply fpr as much as possible vacancies, complete and true details for eligibility criteria, application submission, its important dates, selection process and the essential guidelines required in the throughout process are informed to you. The Chekrs provides extraordinary study material which helps you to excel in the exam that you are preparing for. Here you can get previous papers, sample papers, model papers, syllabus and the online tests. Also through quiz and current affairs you can stay updated for the recruitment exams.